Faith in Public Life (FPL) is a strategy center for the faith community advancing faith in the public square as a powerful force for justice, compassion and the common good. Over the last ten years, FPL has trained and mobilized a diverse network of tens of thousands of faith leaders across the country, changing the narrative about the role of faith in politics, helping win major progressive policy victories, and empowering new religious leaders to fight for social justice and the common good. Our strategic campaign expertise, media savviness, and rapid-response capabilities have made us respected commentators in the media and valued partners with a range of religious & secular groups working for social justice. 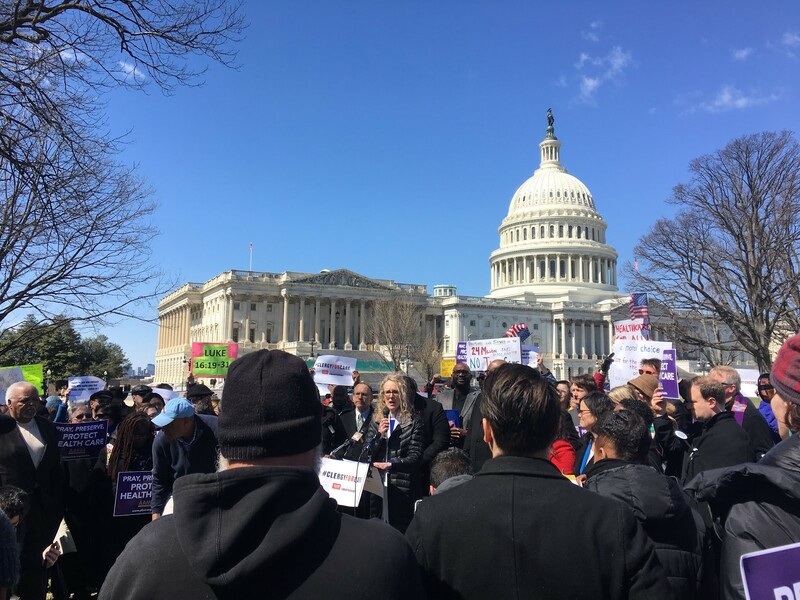 On Wednesday March 22, Faith in Public Life led a Moral Rally with Rev. William Barber II and over 200 faith leaders calling on Congress to preserve health care by rejecting the American Health Care Act. We bussed in clergy from as far as Ohio, Tennessee, and Rhode Island and stood with individuals like Frankie Macken, a 1-year-old from Virginia, whose life was saved as a result of the care she and her mother received through the Affordable Care Act. After we rallied, we led a march to Speaker Ryan’s office to demand a moral commitment to health care for all Americans. We left our sacred texts and stories of affected families like Frankie’s at his locked door as a reminder of the guiding principles that unify all faiths to care for the most vulnerable in our communities. Most importantly we called out Speaker Ryan and the AHCA Bill for what is-- the greatest attack on the poor in recent history. Our efforts paid off. The following week, Speaker Ryan pulled the AHCA Bill because it did not have enough votes to pass. Many congressional leaders cited the outcry from their constituents as a critical factor in withholding their support. To see FPL in action you can check out the rally on our Facebook page, as well as our exchange with Speaker Ryan’s staff as we turned his hallway into a sacred space for faith leaders to proclaim our moral mandate to heal not harm.